Neoloy Geocell® reinforced runway and taxiway shoulders make it safe for aircraft if they veer off the pavement while taxing, landing or on take-off. Shoulders provide a critical transition and safety zone on the edges of runways and other airport pavements. The strength and stability of runway shoulders is critical to be able to support heavy aircraft in an emergency, even on soft soils. Neoloy Geocell soil stabilization improves the bearing capacity of soft soils. This increases the strength of shoulders to safely support even heavy aircraft loads if required in an emergency situation. The Neoloy behaves like a semi-rigid beam, which distributes loads laterally to reduce vertical stresses This means that the runway shoulder modulus can handle sudden heavy-duty loads. 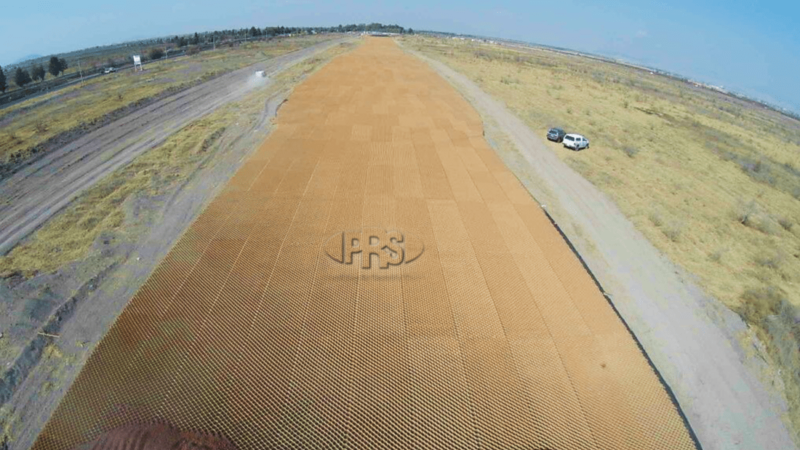 The surface of runway shoulders may be grass, gravel or asphalt depending on the airport design factors and aircraft requirements. A Neoloy stabilized unpaved shoulder with grass surface cover can provide sufficient reinforcement for emergency aircraft traffic. The green surface not only provides a more natural and aesthetic environment, it reduces heat absorption (heat-islands) of these large areas as well. Additionally, Neoloy Geocells are self-draining systems ensuring adequate infiltration and/or drainage of runoff water. This is critical issue for large open areas adjacent to runways and other airport pavements, as standing water will attract birds that can threaten aircraft safety. Neoloy Geocells are a 3D mechanical soil stabilization solution made of stiff and strong Neoloy novel polymer alloy (NPA) designed for long-term pavement performance. Neoloy Geocells reduce vertical stresses on top of the pavement, distribute loads laterally and reduces pressure to soft subgrade soils. Neoloy based geocells guarantee more stable cell geometry than in HDPE geocells. The result is a more durable and reliable solution to reinforce airport runway shoulders for emergency use. Stiff, strong and durable ground stabilization with guaranteed lifespan.